What is going to support your team into its' full potential? Whether you are a new team, a team in transition or a virtual team, Potentials Realized offers a number of services to support you to become extraordinary. 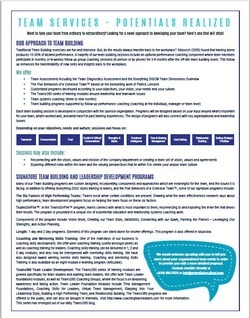 We offer programs for intact teams, virtual teams, as well as specialized programs for leaders of teams. What is wanting to happen in your team? The impact of these changes leads to enhanced business and team productivity and performance on a team level. Team coaching and team building sessions can be delivered onsite, offsite or by phone. Creating powerful and positive "team ways of working"
Since 2004, we have provided programs to a variety of teams in the corporate, non-profit, governmental and international sectors, including the United Nations system, St. Joseph's Health Center Foundation (Toronto), CCAC Toronto, and the financial service industry. For more information on any of our services, please contact Jennifer Britton at (416) 996-TEAM (8326) or at info@potentialsrealized.com. We would be pleased to speak with you about your needs, and develop with you a customized solution. We look forward to hearing from you!